OYSCATECH 2017/2018 Admission Status Notification. 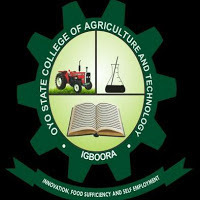 Oyo State College of Agriculture and Technology, Igboora wishes to inform all candidates seeking admission into the institution for 2017/2018 academic session to regularly check their email for message from JAMB requesting the newly admitted candidates to accept the offer of admission given to them for 2017/2018 academic session. All are to note that failure to satisfy this requirement will imply that such candidates do not accept the admission offered to them. Hence, JAMB will automatically withdraw the admission to such candidates after a certain period as a consequence. All candidates are to pay special attention to this information for necessary compliance.